From: Barbara Streit/Urs Schweizer, Zurich – reprinted with permission from umc-europe.org. 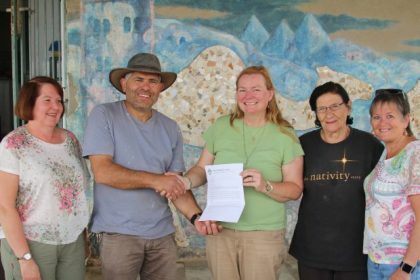 “Why we?,” the couple asked when they realized that they were selected to be the recipients of the 2014 World Methodist Peace Award. “We did not do anything special,” stated Hugh Johnson during the official ceremony. “And we particularly did not do it alone,” but always in cooperation with other members of the small Christian community in Algeria. The Peace Award is presented to people who are, in a unique way, examples of courage in the service, of creativity in the commitment to peace, and of consistency even in the face of difficulties – or, as Gillian Kingston from Ireland also said, to people who have “overcome the fear of the stranger.” The Vice-President of the World Methodist Council presented the Peace Award, together with General Secretary Bishop Ivan Abrahams from South Africa, during the gathering of Switzerland-France-North Africa Annual Conference. 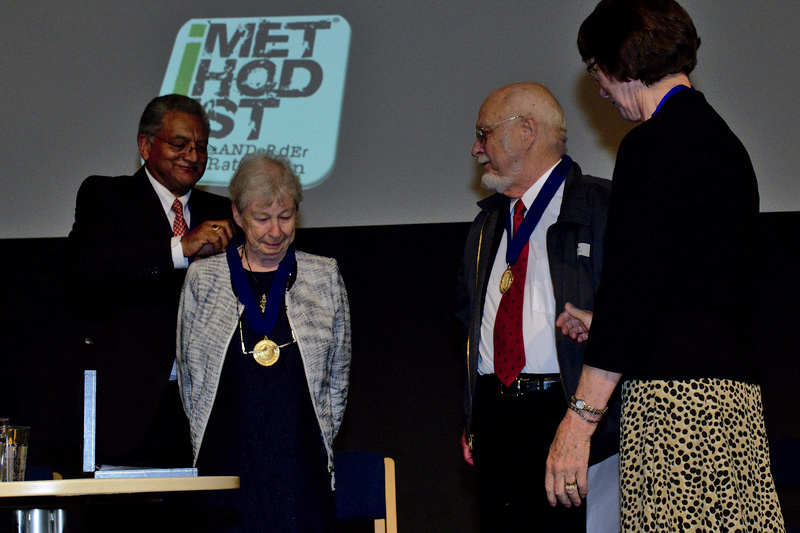 “I cannot think of people more worthy of this honor” than Hugh and Shirliann Johnson. Many people would feel that attacks on them personally and on their home would be good reason to leave a country. But in spite of a number of dangerous situations, they had made North Africa their home and also “opposed the authorities” in their stand for the faith. However, the Peace Award would not only be an expression of honor and thankfulness for a life-long work and witness, but also a sign “that we identify in an appropriate way with the suffering church” in North Africa. When I accompanied them in their service, there were many alarming situations in regard to the Christians in Algeria and also in regard to the safety of Hugh and Fritzi Johnson. From time to time friends from the USA and from Europe put pressure on me and told me that it would be time to get Hugh and Fritzi out of the danger zone. But when I once visited them worrying about their safety and trying to evaluate the situation, Hugh responded to my concerns with the following words: “The church needs to be present where the needs are the greatest!” To temporarily leave the area of political and social conflicts was beyond question for them. But the price was high: One day Hugh was attached with a knife and only hardly escaped death. And when visiting the local churches spread over the country, he always had to take roadblocks into account – and it was never clear whether they had been prepared by military or by revolutionary forces. Therefore he always had to be worried about his and his fellow travelers’ lives. Hugh and Fritzi always showed a deep solidarity with the people in Algeria and Tunis – with Christians and Muslims, with the poor and with migrants. Whoever knocked on the doors of the church center was welcomed. This solidarity was echoed in an impressing way one day. During the time of the war in Iraq, a furious crowd of Muslims attacked the house where Hugh and Fritzi lived. The situation was very dangerous – and then the neighbors surrounded the house with a protecting human chain. The solidarity of the two missionaries was also directed to the Sahraoui people (West Sahara), which then and still today live without a right to their own state in a refugee camp close to Tindouf in the Algerian desert. Together with Fritzi I visited these camps and was able to see the ministry particularly with women and children. Fritzi was involved in the education of the kindergarten teachers, and she took care that fresh herbs were brought into the camp so that the families could discuss their problems while preparing and drinking their traditional tea. The young people were often sent from the camps to the former socialist countries in Europe. After the political changes in 1990, these students lost their study place and their financial support. Fritzi was symbol for the narrow bridge between the camps of the Sahraoui and the world. There were also tensions among the minority of the Protestant Christians in Algeria. People who live in a society suffering from civil war and violence show different attitudes to deal with the ongoing threat. Part of the Protestant Christians lived out a quite aggressive understanding of mission, which was easier in the Kabylian mountains than in cities such as Algiers, Oran, and Constantine. The more fearful ones distanced themselves from such provocations. Those who would live out an aggressive understanding of mission would not only endanger themselves but also all other Christians. Here, Hugh and Fritzi also served as bridge-builders between all Christian minorities in the country. Because of his cooperation with the Algerian Radio and the dialogue with Muslim people, Hugh tremendously contributed towards an understanding between Christian and Muslims. Dear Hugh and Fritzi, in order to establish friendships and work for peace and reconciliation, profound knowledge of the history of North Africa is needed. The willingness to learn the languages of the population (be it Arabic, Kabylian, or French) is required, as well. From the very beginning of your service in Algeria and North Africa you gained such competencies. In a context shaped by agitation and outrage, first of all a calm rooted in faith is required. A clear mind regarding how to deal with religious issues is required. Where social distress and restlessness shape the togetherness, much love and endurance is needed. All these gifts have impacted your service. The presentation of the Peace Award is an opportunity to sincerely thank you for your service of 42 years in North Africa and for your witness of Christ. When I was a child in Germany one of the ways I learned world geography was by identifying the locations of United Methodist missionaries. Missionaries were frequent visitors to my parsonage home and I became fascinated by locating their places of work on the map, and the areas where missionaries I only read about witnessed to Christ. Hugh and Shirliann—“Fritzi”– Johnson were for me the church in Algeria. I never met them as a child but I knew they were there representing The United Methodist Church and the love of God. I followed their careers over the years and one of my great pleasures in my present job was that of introducing Hugh to the directors of the General Board of Global Ministries last year when he visited us as part of a group from the United Methodist Missionary Association. The Johnsons are among the most legendary of the missionaries of Global Ministries, beloved by their covenant congregations and annual conferences, and publicly devoted to interfaith dialogue and humanitarian programs. He became an elder in the Switzerland-France-North Africa Annual Conference, which appointed him to Global Ministries for service as pastor and superintendent in Algeria. Forty-two years of service! What a legacy! And in a land of turbulence and uncertainty, especially for Christian communities, but a place of great cultural depth and historical distinction. Hugh and Shirliann—Fritzi—learned French, Arabic, and Kabylian to become proficient in their work. He had studied classical languages in college in Virginia, having been raised in Kentucky. Fritzi, a native of New Jersey, had studied at The Yale Summer Institute of Languages. They both have multiple university and college ties. A chronology of their work in Algeria would take many pages. They were first in the Kabyle Mountains east of Algiers, then for many years in the capital city. Hugh had a circuit covering 86,000 square miles. Fritzi was a teacher and worked especially in teacher training for those engaged with refugee and special needs youngsters. The Johnsons weathered a war of independence, shifting ideologies, chilling government attitudes toward churches, and restrictions on worship and Christian education. They also correctly read the signs of the times and became prophetic in seeing and warning about the radicalization of underemployed, economically frustrated young Muslim men of North Africa and the Middle East as the 21st century opened. Hugh and Fritzi Johnson were ambassadors of God peace and justice in Algeria and in their relations with all those people they encountered over the years. They promoted ecumenical mission, interfaith dialogue, and especially emphasized the need to take part in dialogue and collective efforts for peace with Muslims. Bishop Hope Morgan Ward, president of the General Board of Global Ministries, and the directors and staff of the agency join me in saluting Hugh and Shirliann Johnson, stalwart in God’s mission and worthy recipients of the 2014 Methodist Peace Award. The first area, in which Hugh and I could share our hope, was the ecumenical field. We were a small group of Christians in Alberia, where the population was almost entirely Muslim. The Protestant Church of Algeria (a union of Reformed, Methodist, and Lutheran Christians), the Eglise évangélique, in the beginning part of the North Africa Mission, for some time the Orthodox congregation, Anglican, Coptic, and Libanese Christians, Maronites, the Latin Catholic church… When the leaders met for sharing, we were most often hosted by the Johnsons. It was also in their house where we had to react to a new law in February 2006, which imposed new administrative regulations on us. We decided not to jointly build a front line but to individually approach the Ministry of Religious Affairs in order to administratively clarify our situation. We did this aiming to help the evangelical churches to be recognized. These churches were new ones, formed by people converted from Islam to Christianity. We also shared our hope in jointly supporting the Bible Society, which is managed today by Ali Khidri, but which is still presided by Hugh and myself. Together we have thought about the steps, which would secure our right to import Bibles and to distribute them – not only in the official languages (High Arabic, Algerian Arabic and the Berber languages), but also in foreign languages such as Chinese, for people who, in their own country, did not have access to Bibles. The Bible Society had its office in the facilities of the Protestant Church of Algeria. Together we also supervised the Bible translations of these times. Thanks to his knowledge of the Tamazights, Hugh was qualified very well to do this work. A third area of cooperation was the diaconal work and the commitment for human rights. Then, it was the ecumenical association “Comité Chrétien de Service en Algérie” (CCSA), today this organization is called “Rencontre et Développement,” and it also has its office in the facilities of the Protestant Church of Algeria. First we supported the liberation movement in Africa (South Africa Guinea Bissau, Angola, Moçambique, etc.) and called for a service in Algeria; today the primary focus group are migrants. Within this service, Fritzi played an important role in the support of Sahroui-refugees from the West Sahara. Together we secured the Christian presence in Algeria – even throughout difficult years. Together with Pastor Oul Aoudia we visited Hugh, when – during the war in Iraq – his congregation was attacked by youth. Together we also visited the president of the Jewish community in the synagogue, when this building was devastated. During the crisis in Algeria, Hugh was personally attacked and threatened with a weapon. But Hugh and Fritzi endured these difficult situations and became an example for all, Christians and Muslims, because of their calm, their trust in God and their commitment to peace. I think that the fact that Hugh and Fritzi had to leave Algeria was caused by Hugh’s brave commitment for the first leaders of the evangelical congregations, which he had educated. When the authorities did not prolong his residence permit, we four bishops in Algeria wrote a joint letter to the Ministry of Religious Affairs, in which we asked them to reverse their decision. On the day he left, I personally brought Hugh to the airport, and I am grateful to his church, that Hugh’s and Fritzi’s commitment to peace is honored tonight in this celebration. 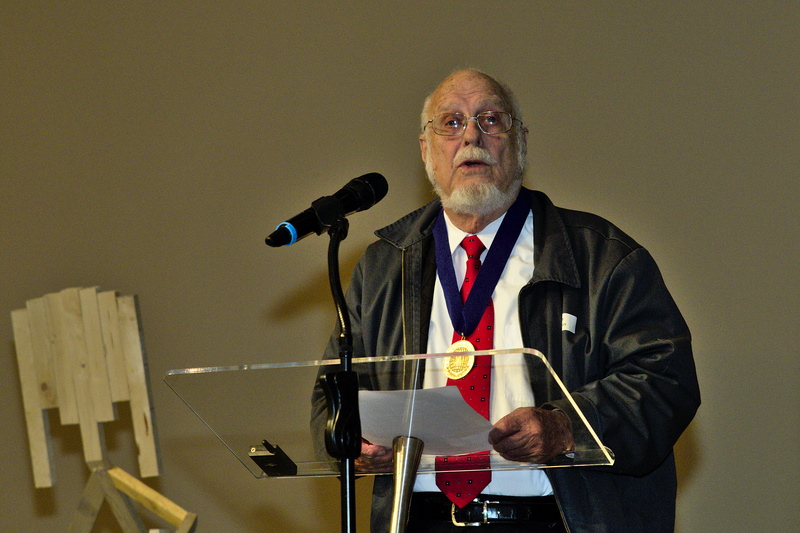 Hugh Johnson responds after receiving the World Methodist Peace Award. It is interesting that many people facing a sudden tragedy for which they could not adequately prepare – or for which they could not prepare at all – ask why this or that would happen to them. Whether it was expected or not, whether it was welcome or not, the question seems to be inevitable and always the same: Why we? Why me? Actually, this was our first reaction, as well. Is there anything special we have done? Even trying to understand why anybody might think highly of what we have done – or might think highly of the stupid things we have not done – we rather remember in both cases a number of other people and what they have or have not done and of what others should be reminded. The comparison of us and previous recipients of the World Methodist Peace Award seems to be ridiculous. And when we spoke to assemblies, we often clearly stated that we walked in the footsteps of giants, who have preceded us. They also deserve appreciation – but it is almost too late. However, it is this thought that allows us to actually accept this special honor today – in the name and in the place of all those who have preceded us on the same way of peace and reconciliation. Because we have to state that they have been the ones who showed us the way to be followed – serving God, the church, and the working field. Not in order to aspire to any honor, but, like them, in order to put God’s love into action for the salvation of the children of God – whatever the description or origin of these children of God may be. It’s about finding the mission, which is entrusted to us: to love – to love God, His children, the world, wherever He might send us to. Therefore we particularly remember the cloud of witnesses, who have preceded us in the divine work in North Africa, Christians and Muslim people of all ranks. And we are particularly joyful that tonight, representatives of the UMC are among us who have come from Algeria, and who have taken over responsibility for the work today. But when being honored tonight, we do not want to forget those people of other Churches and Missions in North Africa, with whom we obediently and faithfully worked together. And first and foremost we could not omit to particularly mention those Brothers and Sisters of the Roman-Catholic Church in North Africa (tonight represented by retired Archbishop Henri Teissier), who have suffered so much during the “dark decade,” but who still have supported us so much during this difficult time. It would be a sin not talking about this. A number of biblical texts encourage us to continue this joint service. We particularly think of the letters of Paul (Romans 12:1-21 and 1 Corinthians 9:19-23) where we are called to be open towards all so that some of them might be saved. In this way all Christians – those in the past, in the future and in the present – are people making visible God’s love, which includes all men, all women, and all children – because all of them are creatures of God, all are loved from God. We are reconcilers in the name of God – but in very different ways. During a life we can be pastor, taxi driver, bricklayer, carpenter, painter, teacher, coach of a soccer team, referee on the field or in a family dispute, church historian, mechanic, interpreter, singer of hymns or a conductor. The aim is, as Paul states, to be everything to all! Therefore: When it’s my turn now, I would like to turn to you to advocate for opening ourselves to the greatness of God. We are invited to the project of God for this world; a world, in which our lives are lived out in the name of God, without personal ambitions, but that God’s joy over us and in us might be complete. 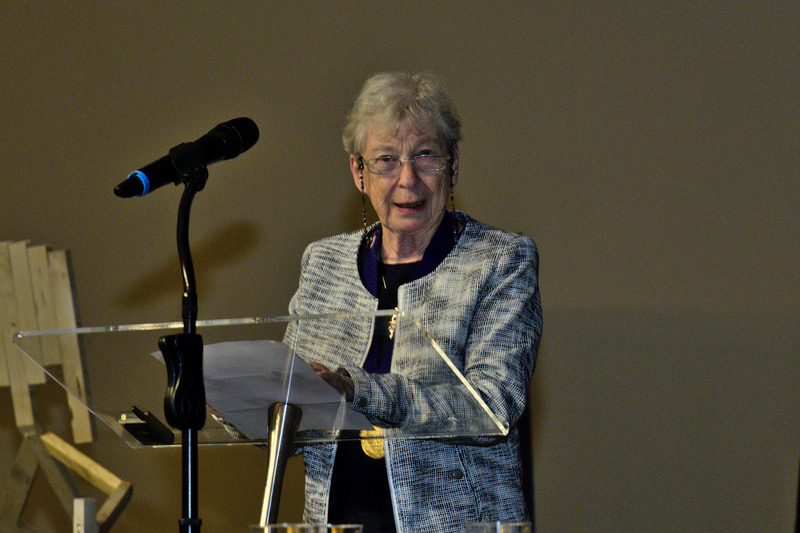 Shirliann “Fritzi” Johnson responds after receiving the World Methodist Peace Award. What to say if the sky is falling on you? We are deeply touched by being honored for our service in North Africa in such a unique way. However, we neither did something special nor were we alone on our journey. It was a long-term ministry, which started with our predecessors, and which will continue with those following after us. God has called us to a service in Algeria. The area around the Mediterranean Sea, to which this country belong, is the area where three continental plates come together, it is origin of three monotheistic religions and – since thousands of years – source of cultures and customs. Ever since this was an area of sharing – but unfortunately also an area of conflicts, in which the parties often claimed to act «in the name of God». “Love each other as I have loved you.” This first of the Great Commandments served as Leitmotiv in our lives. To encounter the other person with full respect, to accept him unconditionally and to reach out the hand in a brotherly way – only by doing this a dialogue is possible. Of course dialogue also entails risks: the risk to change the other, but also the risk to be changed yourself. We are very grateful to the General Board of Global Ministries for offering us the needed time for studies and preparation – this has allowed us to let ourselves in for the encounter with the Islamic world and to enlarge and deepen our knowledge of Islam as well as the North African culture on the spot. We are also grateful to our missionary colleagues and to the Algerian Christians, who have received us and who served as mentors. The Second Vatican Council widely opened up the doors for the encounter of Catholics and Protestants. It was a great joy for these two communities to discover each other, to cooperate and to pray together in a very deep way and to live a joint witness of a Christian minority in a Muslim world. And it was also an enormous support in moments of sadness, suffering, and grief. We thank our two succeeding bishops as well as Connexio for never having ceased supporting us throughout all these years – and particularly not during the very difficult times. To our daughters who fully lived out the motto “love – encounter – serve” and who still do this in their families, each in her unique way, wherever they are: respect! To all those who prepared this joyful evening and contributed to it, and to you all having come from far and near: thank you for this wonderful encounter.